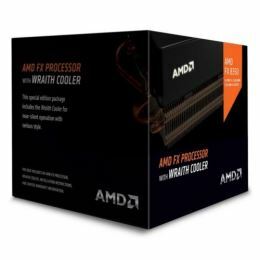 Featuring near-silent 39dbA operation, the AMD Wraith Cooler is practically inaudible when installed in your PC.1,2 That’s less than one-tenth the noise of its predecessor, but with impressive thermal performance thanks to 24% more cooling surface fin area and 34% more fan airflow.3,5 Backlit illumination and an attractive fan shroud makes the Wraith Cooler an impressive piece of hardware that every PC enthusiast can be proud to show in their system. We call it the new AMD FX 8-Core Processor Black Edition and it’s unlocked for your overclocking pleasure.1 Experience unmatched multitasking and pure core performance with the industry’s first 32nm 8-core desktop processor. Get the speed you crave with AMD Turbo CORE Technology to push your core frequencies to the limit when you need it most. Go beyond the limits of maximum speed with easy-to-use AMD OverDrive™ and AMD Catalyst Control Center™ software suites. But the best part of all? You’ll get all this impressive performance at an unbelievable price. You’ll be asking yourself “what competition?” in no time. • The industry’s first and only native 8-core desktop processor for unmatched multitasking and pure core performance with all-new “Bulldozer” architecture. • New 32 nanometer die shrink designed to reduce leakage for improved efficiency, increased clock rate headroom and better thermals.